What Day Of The Week Is October 31? 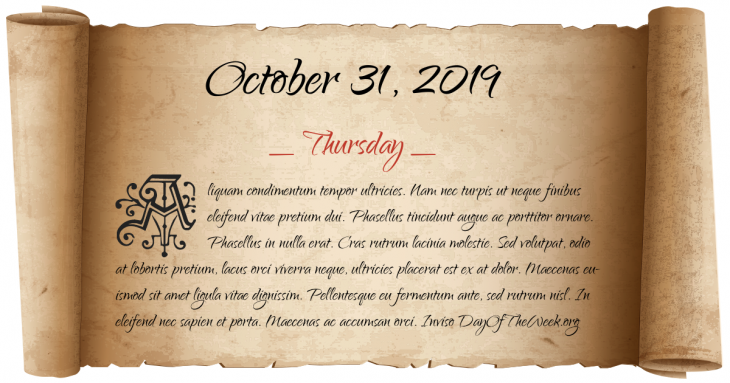 October 31, 2019 is the 304th day of the year 2019 in the Gregorian calendar. There are 61 days remaining until the end of the year. The day of the week is Thursday. The Indianapolis Street Car Strike and subsequent riot begins. World War I: Battle of Beersheba – “last successful cavalry charge in history”. World Savings Day is announced in Milan, Italy by the Members of the Association at the 1st International Savings Bank Congress (World Society of Savings Banks). Magician Harry Houdini dies of gangrene and peritonitis that developed after his appendix ruptured. World War II: The destroyer USS Reuben James is torpedoed by a German U-boat near Iceland, killing more than 100 United States Navy sailors. It is the first U.S. Navy vessel sunk by enemy action in WWII. Algerian War of Independence: The Algerian National Liberation Front begins a revolt against French rule. An explosion at the Indiana State Fair Coliseum (now Pepsi Coliseum) in Indianapolis kills 74 people during an ice skating show. The explosion also injures 400. A faulty propane tank connection in a concession stand is blamed. Soyuz TM-31 launches, carrying the first resident crew to the International Space Station. The ISS has been continuously crewed since. Who were born on October 31?